“I’ll just have a salad.” How many times have you said that thinking it was the healthiest choice? The truth is, salads can be sneaky. With the wrong choice of ingredients, a salad can have more fat and calories than a bacon cheeseburger. What to do? If you’re dining out, your smartphone or computer is your friend. Even better: build your own, so you can control the ingredients and their amounts. 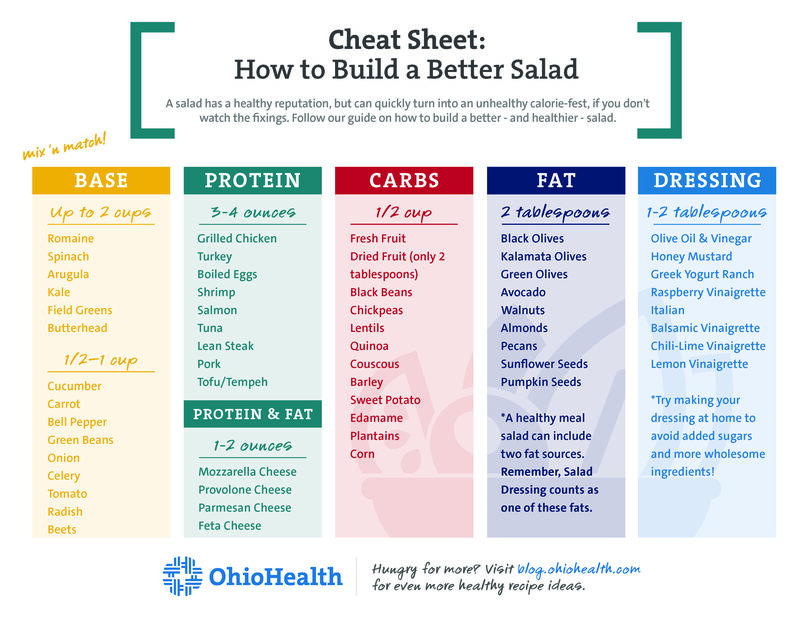 Here are some guidelines from Mills to help you do it right, at a salad bar or at home… and be sure to check out the salad cheat sheet at the end of this article! Whether your salad is an appetizer or a meal, greens and vegetables should be base. The more colorful the veggies, the better. Broccoli, tomatoes, radishes, red onion, yellow squash, carrots and bell peppers will give you a good mix of vitamins and other nutrients. Pickles and pickled peppers are OK in moderation, but keep in mind that they add sodium. Instead of just iceberg lettuce, try adding fresh spinach, kale or other greens. “The darker the leafy green, the more nutrition you will be providing your body,” says Mills. If you’re adding salad to a meal, focus on greens and vegetables. Choose just one “add-on” fat source, such as avocado, nuts or croutons, and keep it to 1 tablespoon. “This way, you’re increasing the nutrition of the meal without adding significant calories,” says Mills. If you’re having salad as a meal, start with a base of salad greens — up to 2 cups. Add an additional 1/2 to 1 cup of cut veggies. You’ll need protein, but keep in mind that a portion is 3 to 4 ounces, and keep it lean. For instance, you could have 2 ounces of grilled chicken, turkey or seafood, along with one boiled egg and 1 ounce of low-fat cheese. Or, instead of one egg, you can try using two egg whites and omitting the yolks for higher protein and lower fat. Cheese-lovers should stick to low-fat choices, such as mozzarella or provolone. Or consider stronger-flavored cheeses such as parmesan or feta, as a little goes a long way. It’s fine to add a carbohydrate source, which could come from 1/2 cup of fresh fruit or 2 tablespoons of dried fruit, 1/2 cup of beans, or even 1/2 cup of grains, such as quinoa or couscous. A healthy meal salad can include two fat sources, about a tablespoon of each. This is where many people go wrong, piling on nuts, bacon bits or other high-fat toppings. Nuts, avocado and olives are healthy fats, but stick with 1 tablespoon. Remember that your dressing counts as one fat, so you may want to skip it in favor of a flavorful vinegar, or lemon or lime juice. If you do use dressing, keep it to 1 tablespoon of regular dressing or 2 tablespoons of low-fat dressing. Vinaigrettes tend to be lower fat than creamy dressings. Finally, for more flavor without added salt or fat, try herbs.